Dr. Chandan Chawla is a trusted Physiotherapist in Hauz Khas, Delhi. 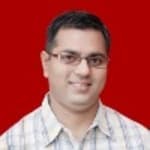 You can meet Dr. Chandan Chawla personally at Ability Physiotherapy Clinic in Hauz Khas, Delhi. Don?t wait in a queue, book an instant appointment online with Dr. Chandan Chawla on Lybrate.com. My name is maan I have a problem in my lower back because of weight lifting in gym. I feel pain right or left both sides. Is it a injury related to disc problem and how I can solve this. Please consult me. Here are some tips for how to handle your back pain: -stop normal physical activity for the first few days. This will help relieve your symptoms and reduce any swelling in the area of the pain. -apply heat or ice to the painful area. One good method is to use ice for the first 48 to 72 hours, and then use heat. Take pain relievers medicine. --while sleeping, try lying in a curled-up, fetal position with a pillow between your legs. If you usually sleep on your back, place a pillow or rolled towel under your knees to relieve pressure. -do not perform activities that involve heavy lifting or twisting of your back for the first 6 weeks after the pain begins. -avoid bending forward and sitting in a place for long time -stretching and strengthening exercises are important. But, starting these exercises too soon after an injury can make your pain worse. -some physiotherapy treatment like ift current can give you some relief. -a full history of your problem should be taken and your movements assessed by a physiotherapist. Please consult a physiotherapist for the same. Good evening. Actually my mother has a severe pain in her leg. She is feeling as any liquid is their in her leg due to which that pain. She consulted many doctors but then also. She is not satisfied with their prescription. Pls suggest something doctor pls. It's because of arthritis, causing inflammatory and excessive synovial fluid accumulation inside the joints. I am 39 years female with slip disc at l4-l5. Also having radiating pain downwards right leg. This could be due to lumbar spondylosis with nerve root compression. Rule out diabetes & vit. D deficiency or any other metabolic disorder. Sleep on a hard bed with soft bedding on it. Use no pillow under the head. Any way take paracetamol 250mg od & sos you will need other supportive medicines also. Do back (spine) exercises make sure you are not allergic to any of the medicines you are going to take you may have to use lumbosacral support for some time. Avoid painful act/activities. Take medicines as prescribed it may have to be further investigated. Do reply back for private consultation and detailed treatment plan. I have shoulder pain since 5 days. I was going gym for daily. What is treatment of that? I advice you to stop shoulder exercises like weight lifting etc for some days. If you want to remain active, go for walk. No use of Overloading shoulder if you feel pain. Let your body heal by its own. Or if pain is unbearable or obstructing your daily activities better you go to physiotherapist or orthopaedic doctors for further investigation and treatment. Regards. Hi, I had a sprain in my feet back on 10th of September. It pained heavily for 2 days making me immobile. But there is still some minor pain till now. What should I do? Find a good physiotherapist and start strengthening excersice so that your joint can regain previous strength. For pain ask for TENS. I'm having pain in right shoulder and back side of my neck. Im morning there was just pain in back of my neck but now my shoulder starts to pain if I move it. My mom got leg knee pain for few years. She's tries more medicals and treatment but no use. Still she got knee pain. What will do for complete relief of knee pain? Please help me for my mom. Hello. Please provide the reason of pain. As you said you have undergone medical treatment .so what was the diagnosis. Do fulfill the needs of calcium vitamin D and other minerals and vitamins. (proper diet + supplements if needed) Do regular exercise. Few post might help you in some way. Regards! Hi I undergone a knee surgery (complete ACL tear) last month 13th. Still I have swelling. Is it common or I have to consult a orthopedic surgeon? Please reply. If you didn't have proper Physiotherapy treatment after your surgery, it's likely to have swelling. Better to go for Physio treatment under a skilled Physiotherapist. Try Icing four times a day, it will help. Consult an Orthopedic Physiotherapist instead of Surgeon. Hope it helps. Thanks. Best wishes. My relative's left leg had been imputed above knee before 5 years. He uses prosthetic limb. But his leg pains a lot. Please help me of how I can make him get rid of his pain. I know it will pain but I am asking fir some remedy so that he can get relief by using that. He has used oils spray and everything. Please kindly suggest what to do. Is their any machine which can relax him or something. Please help. Hi this is post surgical pain which is very common .well take physiotherapy treatment for that which is medicinal free and effective .in yours case. Hi, I am a 22 year old male, I have been having some pain in my left leg (behind the knee and around the ankle) since the past 9 months, I walk and run a lot, even then the pain has not reduced. What might this be? Can it be cancer? ITis not a cancer. IT is not a As arthritis is very common that you get generally bilaterally. Ice therapy would definitely help to reduce the inflammation. We also advise you to use knee cap which would help to prevent the knee from damaging further and also to maintain the quadriceps muscle tone. You can take Ultrasonic therapy in one of the nearby physiotherapy clinics which would help to heal the damaged cartilages along with shortwave diathermy which would help to improve the blood circulation. Simple Knee Exercies Specific knee exercises will also help ie. Keeping ball underneath the knee and keep pressing it. That's the simple exercise which will help you to strengthen the knee Ice therapy would definitely help to reduce the inflammation. We also advise you to use knee cap which would help to prevent the knee from damaging further and also to maintain the quadriceps muscle tone. I also advise you to use knee cap which would help to prevent the knee from damaging further and also to maintain the quadriceps muscle.